Killer Characters: Happy Holidays Again! Hi, everyone! Last month I blogged a bit about the holiday season, and now it's continuing. Merry Christmas and an upcoming Happy New Year! Some of my friends and family members also wanted to blog here this month but I'm in charge--sort of--and decided I'd do it again. I'm having fun seeing lots of friends in Knobcone Heights even on days I'm busily at work at Barkery and Biscuits, and at Icing on the Cake. Business is booming since people know my products make great presents, as well as being good to take to holiday parties--and there are a lot of those going on. And of course everyone who has dogs know how much they appreciate treats, so they're getting indulged as well. I'd imagine not many of you live near enough to me to come and partake in my goodies. That's a shame, but I certainly understand. In any event, I hope you continue to enjoy your holiday season, and I'll be back next year to say hi to you again. 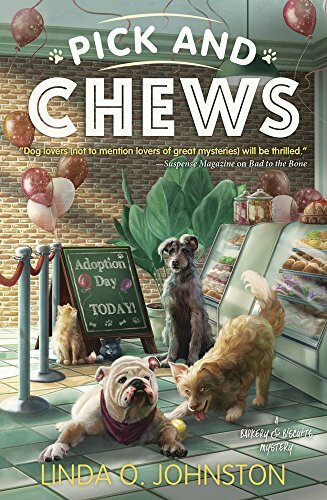 PICK AND CHEWS, the fourth Barkery & Biscuits Mystery by Linda O. Johnston, was a May 2018 release. And watch for FOR A GOOD PAWS next May! Merry Christmas and Happy New Year to you as well. thanks for all you do. Thanks so much, Debby! Enjoy your holidays. You enjoy the holidays too!! Thanks for providing wonderful stories to read.